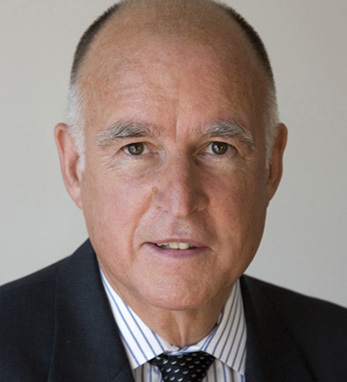 California Governor Jerry Brown is an icon among U.S. politicians. Known for his progressive ideals and dedication to the people and well-being of his state, he is the longest-serving governor in California history. First elected in 1974 and again in 1978 and 2010, in the 1970s, Brown enacted the first Agricultural Labor Relations Act in state history and organized the California Conservation Corp. He would go on to transform a nine-figure state deficit into a six-figure income, make provisions of aid for families in need of support, reform California’s prison system, pioneer energy efficiency regulations in the nation, and more throughout his lifetime of service in state government. Brown was born in 1938 in San Francisco, California, where his Irish ancestors put down roots. His great-grandfather, Joseph Browne, immigrated from County Tipperary in 1849 at the peak of Ireland’s catastrophic Great Hunger. Joseph met fellow Irish immigrant and future wife Bridget Burke in Massachusetts, from where the two would relocate to California in search of fortune and territory in the years to come. That choice would have a lasting impact on California politics, as their descendants – Brown and his father in particular – invested themselves heavily in serving the people of the state that welcomed their family all those years ago. After graduating from the University of California at Berkeley and Yale Law School, the future governor went on to work as an attorney. Brown, whose father served as San Francisco district attorney, California attorney general, and governor of the state from 1959 to 1967, had always had political aspirations. He won his first state victory in 1970 when he was elected Secretary of State for California. Four years later, he followed in his father’s footsteps, becoming the youngest California governor since 1858. Brown thrice ran as a candidate for the Democratic nomination in the 1976, 1980, and 1992 U.S. presidential elections. Following his first two terms as governor, he served as chairman of the California Democratic Party from 1989 to 1991, mayor of Oakland from 1999 to 2007, and attorney general for the state of California from 2007 to 2011. He and his wife of 13 years, the Gap executive Anne Gust, have an adopted Pembroke Welsh corgi/border collie mix named Colusa Brown, who goes by Lucy. Click here to read Brown’s April / May 2018 Hall of Fame profile.